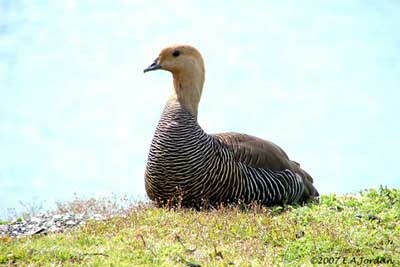 The Upland Goose is a common species, both on South American continent and on the Falkland Islands. These geese are usually seen in large flocks grazing in open grassy meadows and pastures. Adult male in white phase has white head and upperneck. Upperparts are grey with black and white bars on mantle. Rump, uppertail-coverts and rectrices are blackish, and the tail is edged or tipper white. The upperwing shows white small and medium wing coverts, whereas great coverts are black with green gloss. Secondary flight feathers are white, and primaries are black. On the underparts, neck, breast, belly and fore flanks are white. The rear part of the flanks is barred black. Bill, legs and webbed feet are black. Eyes are dark brown. Adult male in barred phase is very similar, but it is more heavily barred black on the lower neck, breast, belly and flanks. The black bars are narrow on the underparts. The vent is whitish. On the upperparts, mantle and scapulars are barred black and white. Female is very different but both phases are similar in plumage. She is browner than male. Head and upper neck are cinnamon. Upperparts are greyish-brown with reddish-brown mantel. On the underparts, breast and fore flanks are reddish with narrow black bars. Rest of flanks and thighs are black, finely barred white. Wings are similar to those of male. She has black bill, dark brown eyes and yellow legs and webbed feet. Juvenile male and female resemble adults, but the young male has dark brown feathers on the head. C.p. picta is found in C Chile and C Argentina to Tierra del Fuego. C.p. leucoptera occurs on the Falkland Islands. This one is larger than nominate, and male has narrower bars on belly. Female has brighter reddish-cinnamon head and wider bars on the underparts. Male and female give different sounds. The Upland Goose male gives repeated whistles, and female utters low, raspy cackling. The Upland Geese continental birds frequent dry pastures and arable lands, and are not necessarily associated with water. This species can also be seen in open mountain slopes at several different altitudes. The birds of the Falklands frequent grassy islands and coastal meadows. Both species often breed near water such as rivers or streams, or near the sea in Falklands, but they also can be found far from water. 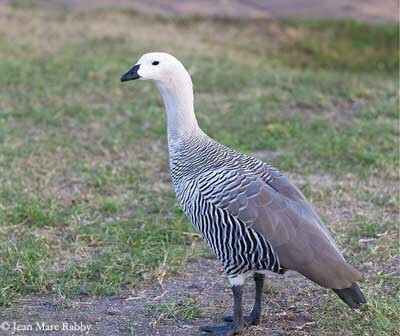 The Upland Geese continental birds breed in S Chile and Argentina, S to Tierra del Fuego. The barred phase is found in southernmost Patagonia and Tierra del Fuego. 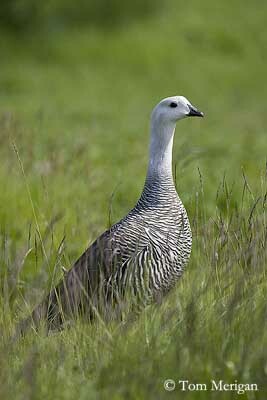 The Upland Goose from Falklands is native to the islands, and has been introduced on South Georgia. The Upland Goose is primarily vegetarian and feeds mainly on plant matter such as leaves, stems, seed-heads of grasses and sedges. It is often seen grazing in dry meadows and pastures, but it also swims very well and can be seen on water, mainly in family groups after the nesting period. 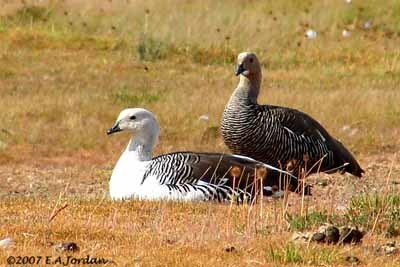 The Upland Goose is gregarious and large flocks of several thousands of birds can gather at abundant food sources such as grassy meadows and pastures, involving competition for food with sheep and cows. For this reason, they are considered as pest by farmers, and heavily persecuted by destruction of eggs and shooting of adults. 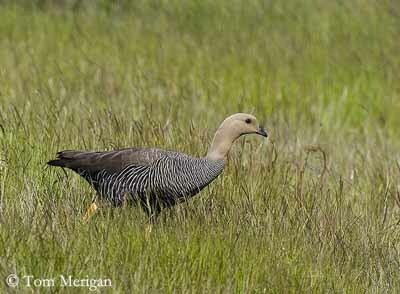 The Upland Goose breeds in densely vegetated areas, and pairs establish the nest-site in plains or slopes. During the courtship displays, the male utters loud whistles and the female responds with softer cackling. They are monogamous and the pair-bonds are fairly strong. Both mates defend strongly the territory, and territorial fights can occur, during which the birds can be injured or even killed. 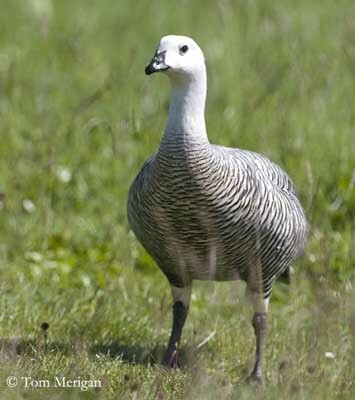 The Upland Goose of the southernmost parts of the range travel to lower latitudes during the austral winter, and can be seen in N to Buenos Aires province and Argentina, and occasionally in Uruguay. The Falkland Islands populations appear more sedentary. The Upland Goose has relatively large wings, allowing sustained flight. The goose performs continuous, rapid wing-beats. 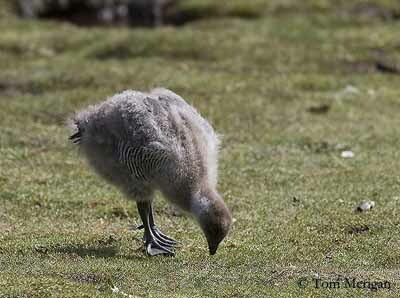 Breeding season starts in Oct-Nov on continent and September on Falkland Islands. 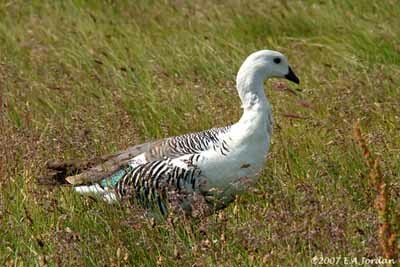 The Upland Goose can breed in solitary pairs or in loose colonies. The nest is on the ground, concealed amongst the dense vegetation. The interior is lined with soft plant material and breast feathers. It is often placed near water. The female lays 5-8 eggs and incubates during about one month, while the male remains in the surroundings and guards the area. The chicks are covered in greyish to brownish down. They leave the nest very soon after hatching, about 15 hours during which they dry their plumage and are brooded. They never return and reach the close water and the feeding areas. They are able to feed themselves from the start. They fledge between 9 and 10 weeks of age, and they can breed at three years. Then, adults moult and become flightless during about five weeks, during which farmers harass and kill them as pest. The successful breeding birds do not moult, sometimes during three successive years, but the most part of them does not migrate and are able to fly, even with worn flight feathers. The Upland Goose feeds by grazing, taking leaves, stems, seeds, sedges and grasses (Poa annua and Poa pratensis). The Upland Goose populations are abundant and widely distributed, and are common in grassy areas. They have natural avian predators, and farmers harass them as pest. However, this species is not globally threatened at this moment.